Ho-Hum Monday No More! Host A(n #Emeril Lagasse) Work Potluck! There are few things in life that aren’t accentuated by the addition of bacon. Hair would be one. Shoes would be another. But just about any food‘s enjoyment value will be exponentially increased by including even just a smidgeon of pig–it’s a proven fact. What would a leisurely breakfast be without some strips of crispy bacon? Lost, that’s for sure. There’d be nothing to balance out the sweet components: no salt to make your taste buds sing! 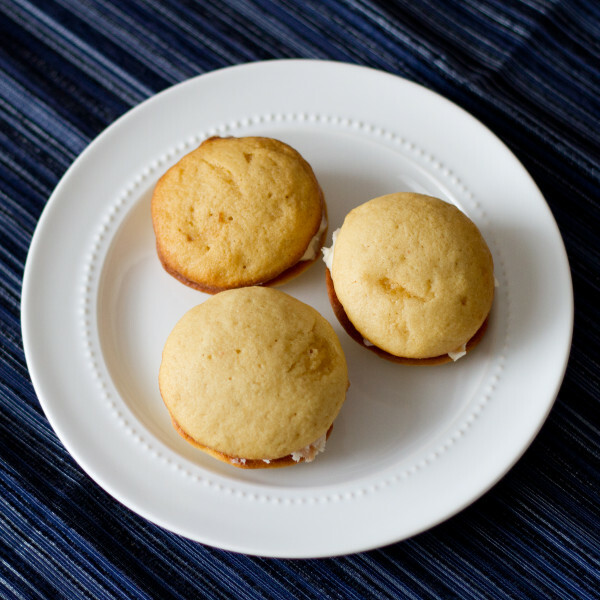 Maple Bacon Whoopie Pies evoke Sunday morning breakfasts, with pancakes, syrup, and bacon all wrapped up into one neat package that you can take with you anywhere. Now I know what you’re thinking. Bacon in a whoopie pie? That’s now how they make it in [Maine, Pennsylvania, insert purported home of whoopie pies here]! And you’re right–that’s now how they’re traditionally made. But if we did things the way they’ve always been done, we’d still be wandering the woods with clubs and rocks, dressed in nothing more than buckskin and a weary smile. Progress. We must monkey with tradition if we’re ever going to get somewhere. Trust me. You’re going to like this. 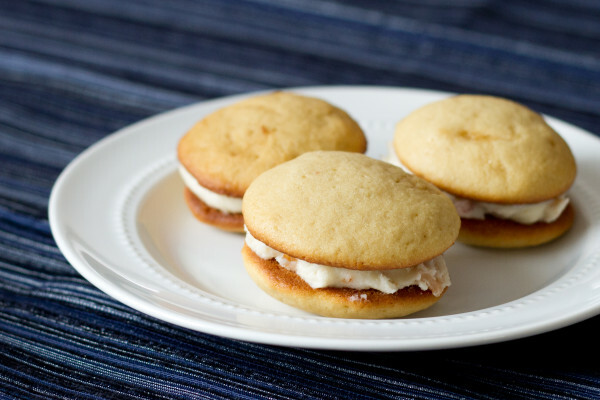 Just give Maple Bacon Whoopie Pies a chance. You won’t be sorry. Line a rimmed cookie sheet with parchment paper or aluminum foil (or that weird mix of the two) and lay out the bacon strips on the baking sheet, being careful not to overlap (you may as well bake the whole package and save the rest for another project). Set oven to 400 degrees Fahrenheit and put bacon into cold oven, setting the timer for 20 minutes, being sure to flip bacon about halfway through baking time. Final bake time may vary depending on how crispy you want the bacon to be. When it has reached desired crispness, remove cookie sheet from oven, transfer bacon strips to a paper towel-lined plate, and pour the bacon fat into a jar to save. Let bacon and reserved bacon fat cool. Once cooled, crumble (or cut with kitchen shears) bacon and set aside. In the bowl of a stand mixer fitted with a paddle, beat together the butter and confectioners' sugar for 3 minutes. Add the whipping cream, vanilla, syrup, and pink salt. Remove bowl from mixer and stir in the crumbled bacon. Transfer to an air-tight container and store in the refrigerator. Preheat oven to 375 degrees Fahrenheit. Get out 2 rimmed nonstick cookie sheets and set aside. Beat together the butter, bacon fat, coconut oil, and brown sugar until light and fluffy. Beat in the eggs, one at a time, mixing until fully incorporated. Add the buttermilk, mixing until smooth. In a liquid measuring cup, add the cream, baking soda, and white vinegar, stirring to combine. Turn the stand mixer on low and mix in half of the dry ingredients. Add the cream/baking soda vinegar mix, mixing until combined. Mix in the last of the dry ingredients. Add the vanilla, and beat until well incorporated. Portion out the batter with a small cookie scoop and bake for 8-10 minutes, or until lightly browned on the edges and the tops are springy. Transfer to wire cooling racks immediately. Cool completely. Remove filling from the fridge at least 20 minutes before starting assembly. Stir before starting assembly. Using a pastry bag fitted with a decorating tip, or simply a butter knife, apply filling on the flat side of one cookie/cake. Press the flat side of another cookie/cake and press gently together. 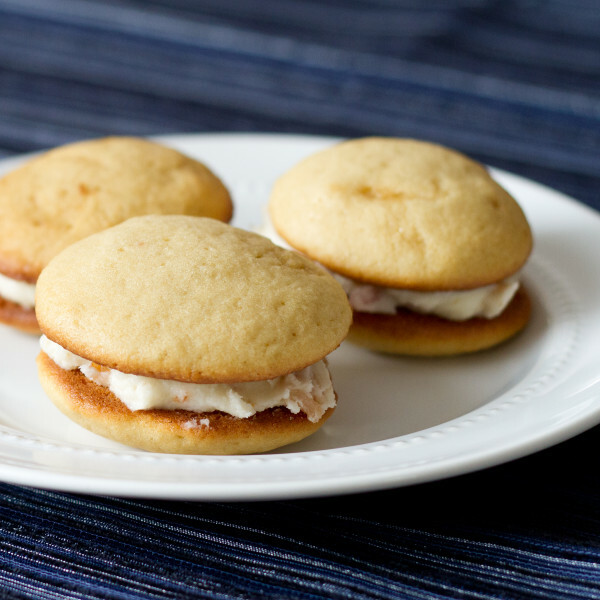 Wrap each whoopie pie in a small piece of plastic wrap, or store in an air-tight container. Be aware that they can get spongy in storage and stick together (hence why I prefer wrapping them individually). Best eaten the same day. For longer storage, keep in the refrigerator. oh wow, these are over the top, yum! bacon in baked goods is a win in my book. I loove sweet and salty combos! Some people think it sounds gross, but really, who has ever thrown out bacon because it got syrup on it when you were eating pancakes? No one! girl, I could not agree more. Everything food-centric is better with a little pig! I love pancakes with maple syrup and bacon all running into each other on the plate… this looks fantastic. Thank you! People are always a little surprised by bacon in dessert, but why not? It works so well with breakfast! I love whoopie pies! And with the addition of bacon, I consider this a complete breakfast. 😀 I would love one for breakfast tomorrow with a giant jug of coffee! I see no reason not to eat them for breakfast…lunch…dinner…snack…dessert. All hours of the day! Oh man do these sound good! Like pancakes and bacon. 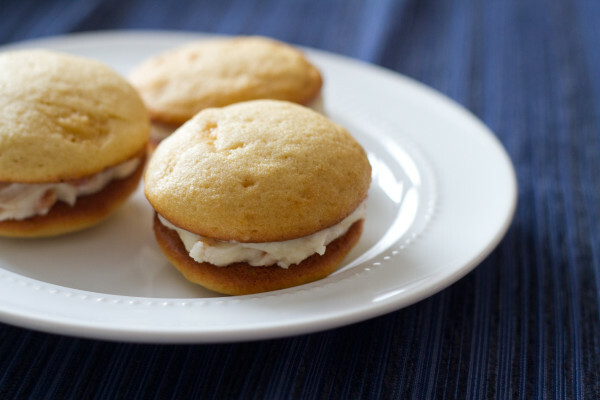 I didn’t know whoopie pies originally had bacon in them. Yeah, I’m pretty sure they didn’t have bacon in them originally…but they should have. 😉 So, so good! Oh, those are beautiful. I thought maple bacon cupcakes were a great idea, but whoopie pies are even better — frosting in the middle = even distribution of awesomeness. I’m trying to make these without having to buy coconut oil. Suggestions? You can use shortening (I’d recommend organic, but that’s your choice). Let me know how they turn out!